Happy first Wonder Wednesday of fall 2018! Last Saturday was the autumnal equinox. Did you do anything fun? 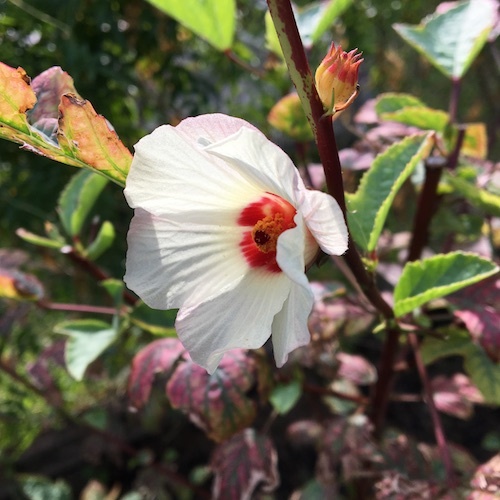 Have you noticed and seasonal shifts? On top of it actually being fall, I learned from friend, fellow nature lover, artist, and Wings, Worms and Wonder collaborator Yuko Miki, of Honeyberry Studios, that this week is “Thinking of You” week! 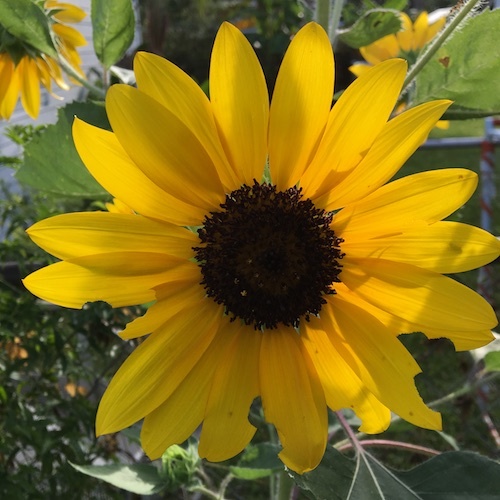 Thinking of You, the online presence, encourages us to connect and “create a wave of happiness by sending cards!” I love it! Back when I was teaching I would often have my own students make and send cards to international pen-pals, grandparents, and even to themselves. And, I mailed each child a handwritten thank-you card whenever they gave me a gift, however tiny and handmade, to let them know how much I appreciated their thinking of me. My good friend even calls me the Mail Bandit! 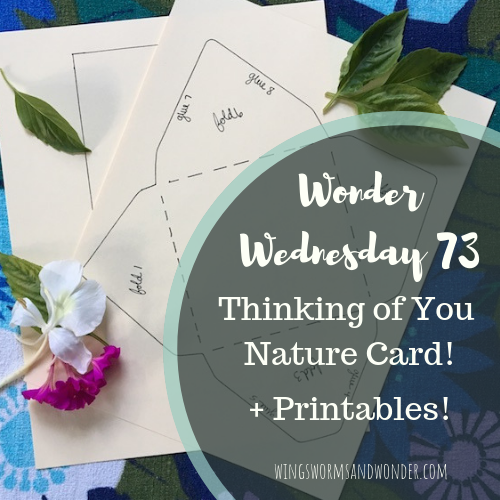 This month for Wonder Wednesday 73, I offer you a handmade card and envelope template PDF printable! And encourage you to make a card, and send it to someone by September 30, to let them know you are thinking of them. Card stock paper, drawing paper, construction paper, or any other paper you’d like to make a card and envelope out of. Markers, paints, color pencils, pens, glue, tape, double stick tape, washi tape, collage materials, drawing paper, construction paper, and any other items with which you feel inspired to make a card! Print off the template printables. Card stock works well for sturdy tracing, but regular paper works just fine too. They each fit on a regular printer size paper. Cut out the templates. They make a square card and envelope! Take a walk in nature to gather inspiration, literally and figuratively. If doing this activity with children, teach a lesson on mail and how to address letters. Trace the templates onto card stock paper, drawing paper, or construction paper. Fold along the designated fold lines and numbered steps on the template and crease the folds with the side of a pencil, ruler, or your fingernail. Decorate your card and write a message on the inside. Decorate your envelope, remembering to leave space for the address, return address, and stamp to be clearly displayed. You could also use blank mailing labels to stick overtop of your decorations if you have them. You can also decorate the inside upper flap of the envelope if you like. Glue or double stick tape the envelope along the designated edges according to the numbered steps on the template. Place the card inside the envelope. Address and stamp your envelope, pop it in the mail box, and smile knowing you are sending a smile! Trace the templates onto seed catalogue pages and then glue them onto the card stock to make seed dreams cards. Collage pressed leaves and flowers onto the card and draw or make rubbings of them to decorate the back side flaps of the envelope. Make a collage from magazine clippings or print outs of your favorite fall nature pictures on the card and the envelope. It could even be color gradient themed. For example, the back of the envelope is red images, the interior flap is orange, and the card is all yellow images. Hand write and decorate a fall nature quote. Then use imagery or single words from the quote to make illustrative teasers on the envelope. 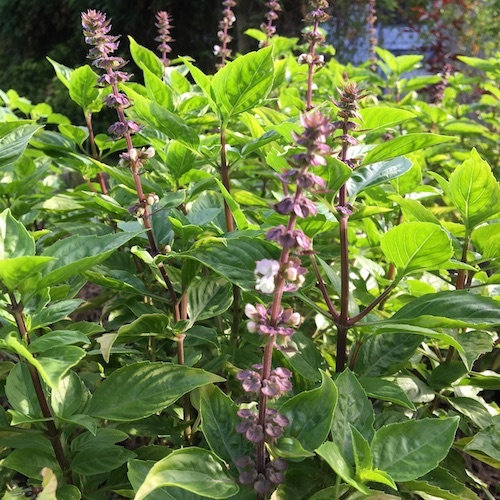 Add in fresh or dried scented herbs like lavender and lemon verbena. Tape down leaves or flowers to the card and then paint or color around them, or trace them, using the nature as a stencil of sorts. Then remove the actual bits of nature. Cut a shape out of the front of the card to make a window – perhaps a leaf shape. Decorate the inside of the card (where you would normally write) with imagery representing the shape you cut out. Write your message on the inside part of the card around the window. Who will you send a nature inspired thinking of you to? 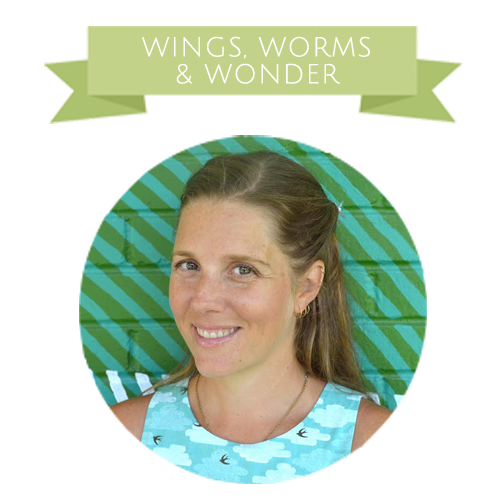 Share pictures of your cards on Instagram #wingswormsandwonder ! Cards are fun to send all the time! Isn’t it he best to go to the mailbox and get something fun rather than just junk mail and bills? Check out the handmade cards for every occasion I have in my Etsy shop and printed cards in my Society6 shop and brighten the mailboxes of all you know! Yuko Miki of Honeyberry Studios has lots of fun cards too! Check out her stationary sets! Learn more about Thinking of You week, September 24-30.